As lovely and extension-filled as Google's Chrome browser can be, some of its little idiosyncrasies (like freezing if you have more than, say, six tabs open) can leave users trembling with barely containable rage. Chrome's got another piece of weirdness up its sleeve, though: if you click or hover over a very specific link, your Chrome tab will abruptly seize up like a cat who's just discovered toothbrushing. Even better, if you copy and paste the URL into your address bar, then hit enter, the entire browser will come crashing down on itself. Cool, right? No, it's not a virus; it's actually an interesting quirk in the way that Chrome handles URLs, and one nobody really knew about until recently. Youtuber/Internet hero Tom Scott made an excellent, in-depth video explaining the computer science behind this weirdness, but to put it very, very simply, Chrome can't wrap its head around the specific string of characters in the URL, and the resulting internal conflict is what brings your browser to a screeching halt. 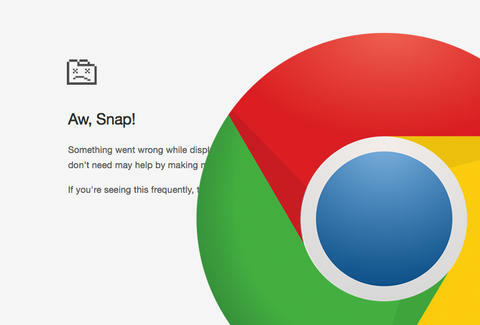 Since you're not likely to encounter it in the wild, though, Google probably won't be fixing it any time soon. Be warned: it will cause this page to crash.